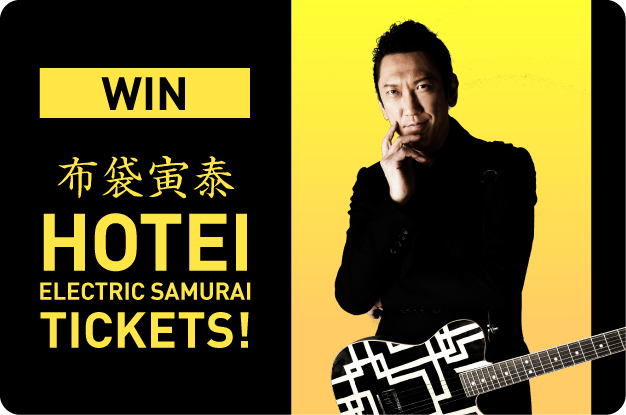 COMPETITION: See Hotei Live at the Empire! He’s back and better than ever! 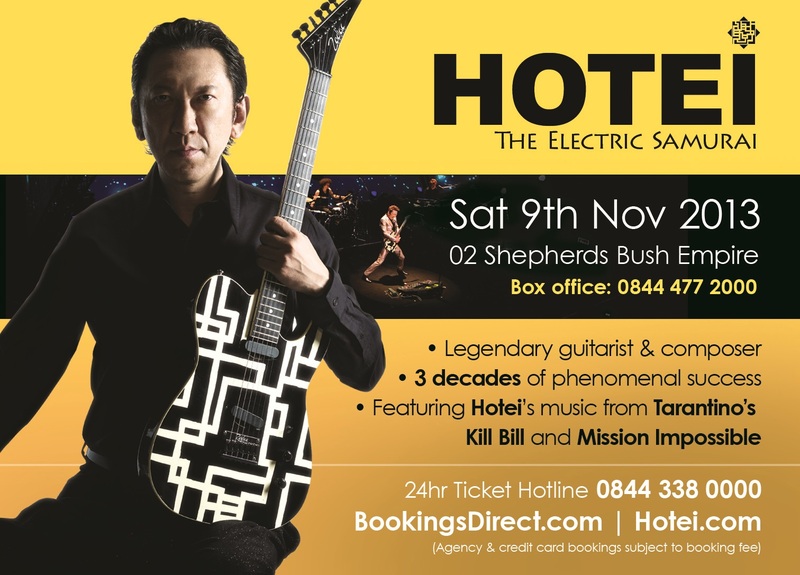 Once more Japan Centre has teamed up with 3A Entertainment to offer one lucky winner a pair of tickets to see Japanese rock guitar legend Tomoyasu Hotei (Kill Bill and Fear and Loathing in Las Vegas soundtracks) at the O2 Shepherd’s Bush Empire on Saturday 9th November. What’s more this London concert will feature a special state-of-the-art visual presentation, as well as an amazing performance band including Toshiyuki Kishi (abingdon boys school), Steve Eto (DEMI SEMI QUAVER), Tony Grey (Trio Project) and Zachary Alford (recording and performance artist with David Bowie, Bruce Springsteen and more). Best known for his timeless anthem Battle Without Honor or Humanity as featured in Quentin Tarantino’s Kill Bill, Tomoyasu Hotei has a career spanning decades and is without doubt a true rock legend. Sought out as a collaborator and advisor by artists from across the globe, he’s worked with talents as diverse as David Bowie, INXS, Blondie, Sigue Sigue Sputnik, Joni Mitchell and Apocolyptica amongst others. If you want to know more about Hotei or get all the latest news and concert information check out Tomoyasu Hotei (World) on Facebook or @HoteiOfficial on twitter! To be in with a chance of winning two tickets, simply leave a comment on this blog post or our Facebook post telling us what’s your favourite rocking movie theme song. You can also tweet us @JapanCentre not forgetting the hashtag #hotei. We will choose a winner at random on Thursday 31st October. The winner must be able to attend the Saturday 9th November performance and cover any transport costs themselves. Posted in Uncategorized and tagged competition, hotei. Bookmark the permalink. The music for Samurai Fiction by… Tomoyasu Hotei! Hotei looks like a cool Paul McCartney! You might not agree that it’s rocking, but SHAFT is up there with the greatest movie tracks. It has to be the theme of ‘Tokyo Drifter’ by Hajime Kaburagi! The film is great too! It has to be the theme song of ‘Tokyo Drifter’ by Hajime Kaburagi! The film is great too! Thank you to everyone who entered, this competition is now closed! We’ll be contacting the winner shortly. For everyone else, please do go and support this great artist and keep an eye out for our next competition! COMPETITION: Win Tickets to Special Lecture ‘Shunga into manga?’!